Should I use The GIVEN Company? Another day, another new “social enterprise” startup in town. Somehow, their pitch was attractive enough to warrant coverage by TODAY. The social enterprise behind it - The Given Company - hopes that by providing a platform for “incentivised giving”, individuals, especially the young, would be motivated to make more donations, said co-founder Charles Tan, 33, who was speaking at its website launch event on Wednesday (Aug 29). I am personally very keen on the notion of giving back to society and eventually hope to do so myself one day in a more meaningful and broadscale manner. So I was instantly curious to find out more. While this effort does indeed sound commendable and probably more than what I’m doing to contribute back to society, I was very bothered by the claim the company is making in the survey commissioned by themselves over a very small sample size. 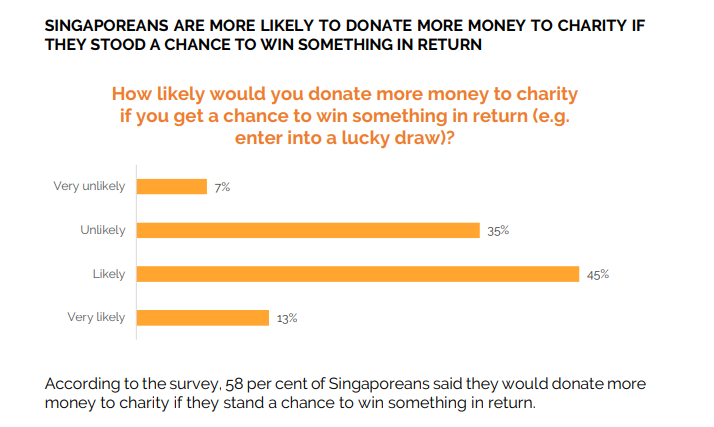 In a survey of 1,845 Singaporeans commissioned by the social enterprise, they found that almost three in five Singaporeans would donate more money to charity if they stood a chance of winning something in return. Well, I’d like to a give people the benefit of the doubt and always assume the best intentions so I went to their website and found their survey report which sorta gone into the details of their survey. It definitely makes for a very catchy line to convince investors and potential donors to join their platform but I find it very disingenuous, even more so as a social enterprise purporting to be “giving back”. What are the fees paid to The GIVEN Company? What are you getting out of this? On average, we charge a small fee of around 5% of total revenue from raffle tickets sold, although the actual percentage may vary slightly on a deal-by-deal basis, depending on how successful (or not) the draw was in relation to agreed fundraising targets with the charities. With their current ongoing raffle, where the founders are aiming to raise S$1 million from the sale of 50,000 T-shirts, After deducting the $180,000 value of the “prizes” and the cool $50,000 “small” fee (5% of total revenue), the charities will have to share amongst themselves the remaining amount. If you truly want to practise altruism and contribute to the less-fortunate and well-deserving causes, I’d urge you to donate directly to the organisations themselves. In a notice sent to donors on Oct 9, TGC founder Charles Tan blamed media reports and the controversy surrounding the lucky draw as reasons behind the cancellation. I mean, at this stage, they’re essentially just a needlessly glorified t-shirt online store?